On International Women’s Day, Queen Mary is proud to announce a new event that is set to champion, encourage and inspire women to bring their skills to the technology sector. Queen Mary, University of London is celebrating its partnership with the Institute of Coding (IoC). In just 12 months, IoC partners have successfully signed-up over 5,000 people onto its leading tech courses at universities across the country. Water Watchers praised for water-saving invention. 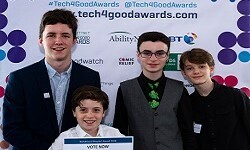 New AI initiative for school students from Code for Life and Ocado Technology. Professor Paul Curzon addresses audience at the launch of AI:MMO. 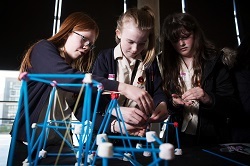 Local schools to take part in UK engineering challenge at Queen Mary, University of London. 540 students from 50 different London schools, 80 teachers and 300 tech volunteers gather at the Emirates Stadium for the annual TeenTech City event. ‘Exceptional and far-sighted’ Teaching London Computing named in the #EDTECH50. 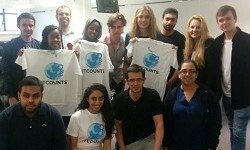 Queen Mary University of London (QMUL)’s award-winning outreach project, Computer Science for Fun (cs4fn) launches its free magazine ‘A Bit of cs4fn’, helping teachers teach computer science to primary school children. Academics from Queen Mary University of London (QMUL) have held digital music workshops in the Philippine capital Manila. The Centre for Advanced Robotics (ARQ) was established to promote robotics research and teaching at the College level. The center is led by Professor Kaspar Althoefer (EECS + the School Engineering and Material Science). To mark the occasion, the Centre for Advanced Robotics invites you to join the Open Robotics Day and ARQ inauguration on June 29th 2017. Scientists at EECS are bringing us closer to understanding the musical experience through a novel approach to analysing a common musical effect known as vibrato. Professor Yang Hao was invited by the IET as one of the recipients of IET AF Harvey Research Prize to attend the official reopening of IET London: Savoy Place in the presence of HRH The Princess Royal. Traditional instruments were transformed by computer science to create sounds previously impossible at the annual Children’s Christmas lecture at Queen Mary University of London (QMUL). What do robots performing comedy, music boxes from China and a jelly pudding have in common? These are just three of the projects that were on display at the Intersections exhibit, which showcased work from the Media and Arts Technology CDT at Queen Mary University of London (QMUL). Do you realise what you are saying when you talk during a conversation? EECS' Cognitive Scientist, Saul Albert, and a team of interaction scientists from the UK will be zooming in on conversations at New Scientist Live in London’s Excel Centre this week. A new Queen Mary University of London (QMUL) programme which aims to inspire and get school students coding has been awarded £40,000 in funding. A new era of innovation and discovery opened when the first UK Robotics Week June 25 - July 1 began. Teams of school students from around the country competed in a robotics challenge involving space missions at an event hosted by the School of Electronic Engineering and Computer Science. EECS Programming Competition 2016: winners announced! The 2016 programming competition took place on Wednesday afternoon 27 January in the Informatics Teaching Laboratory. The competition was run by Dr Paulo Oliva, who has been the organiser of the event for the last 9 years, with the help of Claire Revell, Haris Krekelis and Nikos Tzevelekos. School kids from across London competed to solve the world’s ‘Trash’ problems as part of a First Lego League tournament hosted by the School of Electronic Engineering and Computer Science. On 2nd December 2015, the Magic of Computer Science Christmas lecture hosted by the East London Network, given by Professor Paul Curzon of Queen Mary University of London was truly magical! TeenTech City 2015 was overwhelmingly successful as 520 year 8 and 9 students buzzed with excitement and intrigue at this year’s event held at the Copper Box Arena in the Olympic Park. The BBC documentary 'Climate change by numbers', co-presented by our very own Professor Norman Fenton has received two separate awards this month. £300,000 research prize set to help transform satellite and mobile communications! Professor Yang Hao from Queen Mary University of London has today been announced as the winner of the £300,000 IET A F Harvey Engineering Research Prize. He was chosen from high-calibre candidates from across the world as a result of his outstanding contributions in the fields of microwave, antennas and electromagnetics. Our Ping Pong Fight Club team announced! Minister of State for Schools, Nick Gibb MP, has written to QMUL’s Principal, Professor Simon Gaskell, to thank him for the our contribution to the Network of Teaching Excellence in Computing Science supporting school teachers. Themed issue of the Philosophical Transactions of the Royal Society A published, collected and edited by QUEST researchers from the Antennas Group at QMUL and colalborating institutes. Our Artist-in-Residence Di Mainstone has released a new online film which reveals the voice of the Clifton Suspension Bridge for the first time. Using specially created ‘bridge bows’ developed at Bristol’s Pervasive Media Studio with engineers from Arup and students from the University of the West of England, Di’s team have harnessed the low frequency vibrations of the suspension rods, found a way to turn them into music and captured the event on film. When the New Bus for London visited QMUL! QMUL hosted its third IET East London Network event on 28 August 2014. David Hampson-Ghani, the former project manager for the new Routemaster bus gave a fascinating talk about the project from the competition to design the new bus through the prototyping, including the consultation with user groups, building and testing to the introduction of the first routes. It included video footage of the grueling testing at Millbrook. Book on Body-Area and Wireless Sensors for Healthcare by Antennas Researchers ... Featured! A book, "Co-operative and Energy Efficient Body Area and Wireless Sensor Networks for Healthcare Applications, 1st Edition", has been published by Elsevier. The book is featured on the EDN Europe website and the article author stated ... "deal specifically with emerging opportunities and challenges in the healthcare sector, with novel applications enabled by low-power electronics and “Internet of Things” developments." It is based on research conducted in the Antennas Group and co-authored by current and past members of the group. This years' NIME conference, which took place at Goldsmiths University, featured a one day hackathon centered around assistive interfaces narrowing down disabling barriers to musical and creative expression. The challenge was the following: "Design a musical device that can be easily configured/modified to make music making accessible to all, including musicians with a disability". A hack by Fiore Martin (based on the CCmI diagram editor) won the prize related to this challenge! Miss Miss Nishtha Chopra, a PhD student in the Antennas and Electromagnetics Research Group at the School of Electronic and Computer Engineering was one of the participants of 'Engineering Yes 2014' at which she received an award. EECS’ Phd Student, Nela Brown is supporting a new campaign to inspire women and young girls to consider a career in IT. Nela, who began her career as a sound artist has written a blog post offering advice to young women which will feature in the month long campaign being run by BCS, The Chartered Institute for IT. Year 8 students combined their design and technical skills at an EECS IET outreach day at Queen Mary. Topby Harris, a PhD student form EECS won the overall prize in a national photo competition with an image of robot that can tailor its stand-up comedy routine in response to the audience’s reaction. This year’s programming competition took place on Wednesday 12 February in the ITL from 1pm to 5pm. The competition was run by Dr Paulo Oliva, who has been the organiser of the event for the last 7 years, with the help of Jules Hedges and Dmitrijs Milajevs. A new set of free workshops and resources to support those who teach computing in London will be debuted at Queen Mary University of London on Monday 3 February. The Institute of Engineering and Technology (IET), UK, is celebrating the 50th anniversary of one of its leading publications, Electronics Letters. Please check the following link for further information (http://www.theiet.org/resources/journals/eletters/index.cfm) Prof. Peter Clarricoats of the Antennas Group at QMUL is the founding editor of the publication and has served as an editor for the journal for over 40 years. Please check the following link (http://www.theiet.org/resources/journals/eletters/5001/50-years.cfm), where Prof Clarricoats and Sir Eric Ash talk about how the journal started and also the role it had in changing the field of electronic engineering. The Antennas group (Dr Akram Alomainy) co-organised an exciting event on Motion research, education and industrial applications at QMUL. Attendance was great and the day was very interactive and resulted in many collaborations and potentially a new degree programme in the making. The Antennas Group at QMUL had strong presence in Digital Shoreditch 2013 in the summer with special mentions and talks; Dr Akram Alomainy presented at Digital Shoreditch 2013 'Start me up' about turning science fiction to reality including invisibility and Antennas excellent high quality measurement lab had a mention at Digital Shoreditch 2013 as great places for supporting and starting up creative industries. Dr Akram Alomainy from the Antenna and Electromagnetics Group has teamed up with the Shadow Robot Company to secure funding from the Technology Strategy Board, working on using radio systems and signals for Technologies to Control Advance Telerobotics. Are you more impulsive than a fish? Fishy interactive installation that allows users to measure their own degree of impulsivity. Students at Queen Mary, University of London have the chance to solve problems in healthcare and win £1,000 by using their creative ideas and entrepreneurial skills in a new technology competition!